This post, Marshmallow Pecan Sweet Potato Casserole, is sponsored on behalf of Campfire® Marshmallows. All opinions are, as always, my own. It’s November which means that it’s Thanksgiving season! If you are a long time reader, you know that I have some pretty specific ideas when it comes to our Thanksgiving dinner menu. Our family has some traditional recipes that we don’t really stray from but usually bring a new dish or two to sample. Over the last few years, I have posted all of my Ultimate Thanksgiving recipes: Bacon Herb Oven Roasted Turkey, Sausage Filling, Roasted Garlic Herb Cream Cheese Mashed Potatoes, and Cranberry Marshmallow Relish. There has been one exception: Sweet Potato Casserole. 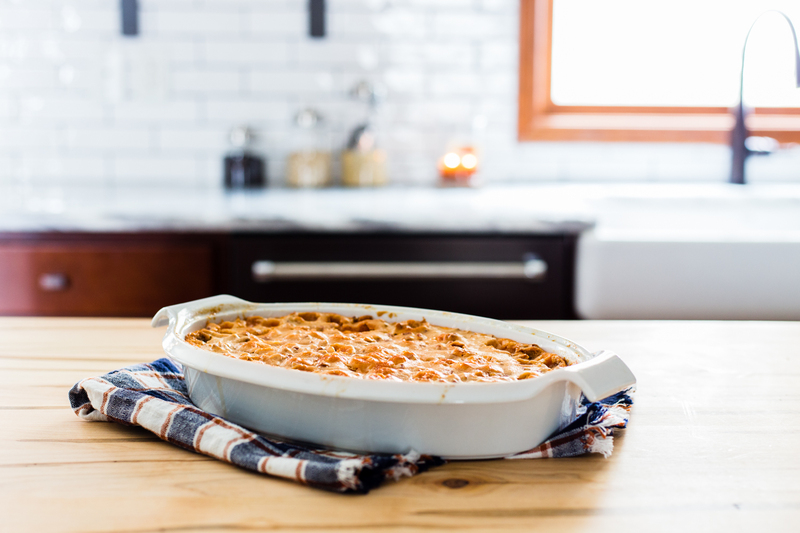 While I shared my twice baked sweet potatoes recipes a few years back, I have never shared my family’s favorite sweet potato casserole. 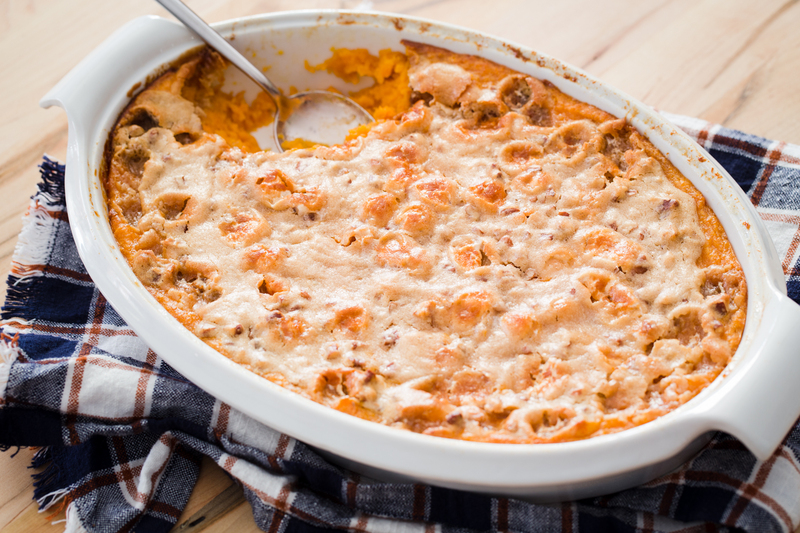 My sister-in-law is typically in charge of the sweet potatoes and that is the recipe that I always go to when making sweet potato casserole. Her recipe includes a candied pecan topping and this year, I decided to add some Campfire® Mini White Marshmallows to the pecans. 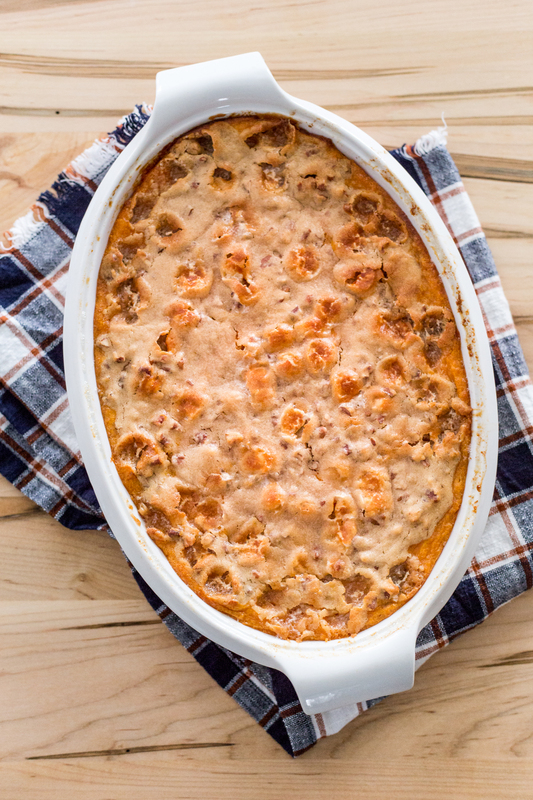 Who doesn’t love sweet potato casserole with mini marshmallows? Add some brown sugar, butter, and pecans and this marshmallow pecan sweet potato casserole is a total winner. 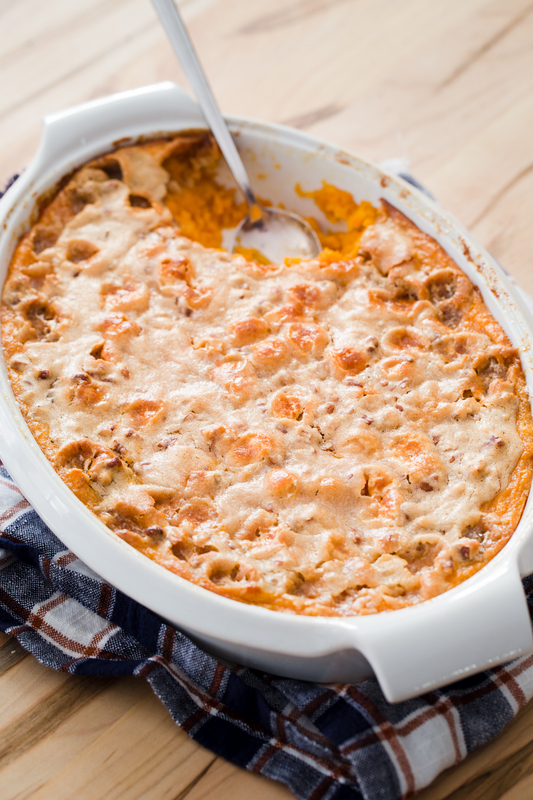 The sweet potatoes are creamy, sweet, and when baked in a large casserole dish, each bit gets just the right amount of topping per scoop. The topping is very coveted. It’s a simple dish to make, but will make your entire family happy! 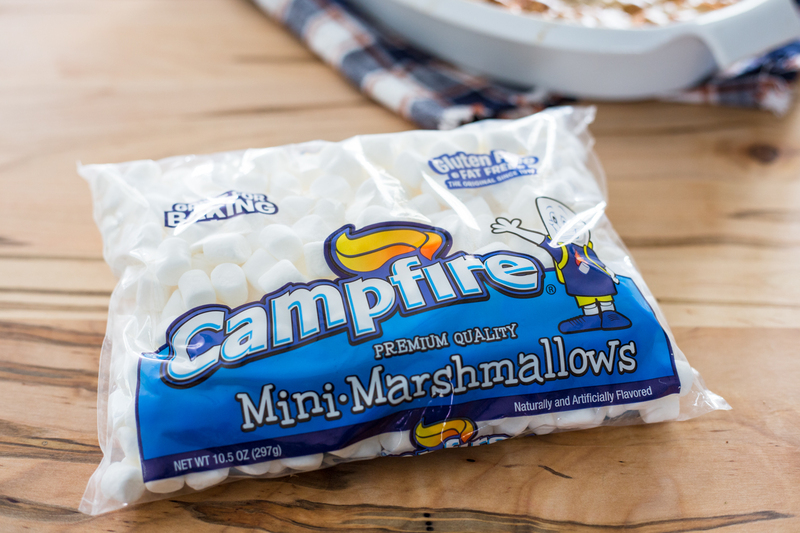 If you love adding mini marshmallows to your favorite dishes over the holiday season, be sure to check out Campfire® Marshmallow’s Make It With Minis Recipe contest! 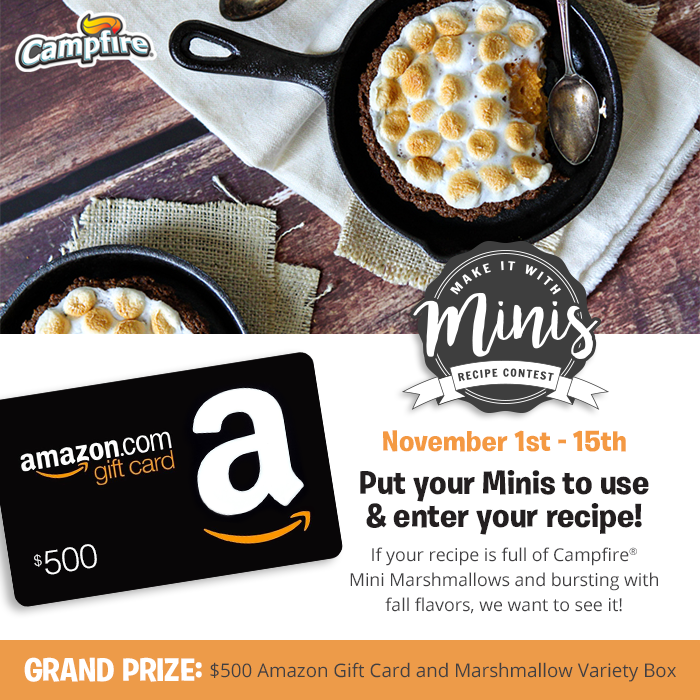 Campfire® is giving away one grand prize – a $500 Amazon gift card as well as a marshmallow variety box. Be sure to check out the link for details and submit your recipe by November 15th for your chance to win. 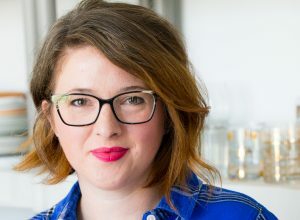 Be sure to check out some of my fellow blogger’s favorite mini marshmallow recipes like my friend Melanie’s Gingersnap Sweet Potato Mousse with Homemade Marshmallow Fluff! This is sure to be a crowd pleaser at your family’s Thanksgiving dinner. Beat together mashed sweet potatoes, granulated sugar, milk, melted butter, eggs, and vanilla in an electric mixer with a paddle attachment until well combined. Pour mixture into buttered 9x13 glass baking dish or oval casserole dish. In a medium bowl, mix together melted butter, brown sugar, flour, and milk. Fold in pecans and mini marshmallows. Spoon mixture over sweet potatoes in an even layer. Bake for 30-40 minutes or until topping is golden brown and sweet potatoes are bubbly. To get 3 cups mashed sweet potatoes, bake 3-4 whole sweet potatoes. Place sweet potatoes on baking sheet in a cold oven. Preheat to 375°F and allow sweet potatoes to come up to temperature with the oven. Bake for 45 minutes. Cut sweet potatoes in half and scoop out insides. You’re so welcome, Kelsey! Thank you so much for stopping by and have a great Thanksgiving!